Elsewhere in Europe, Lenin was leaving Russia. He would be away for five years. 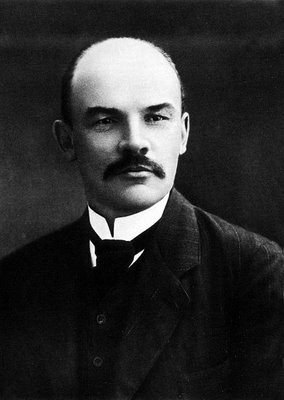 Lenin's movements led to a curious incident in the life of Joe Letts who bore a striking resemblance to the Russian revolutionary. Perhaps as a relief from the heat of the foundry, Joe loved the snow and regularly took his winter holidays in Ronda, a town in southern Spain that stands astride the celebrated gorge of the River Guadaletin. As Lenin was known to be at large, the police forces of Europe were on the alert. Being a look-alike, Joe managed to get himself arrested in Ronda by the Guardia Civil. My grandfather's brother Joe: or could it be Lenin? He must have breathed an enormous sigh of relief when he was finally bailed out, thanks to the proprietor of the hotel he was staying in, who verified that he was a gentleman from Gibraltar who had been taking his holidays there for years and had no connection whatsoever with Lenin. 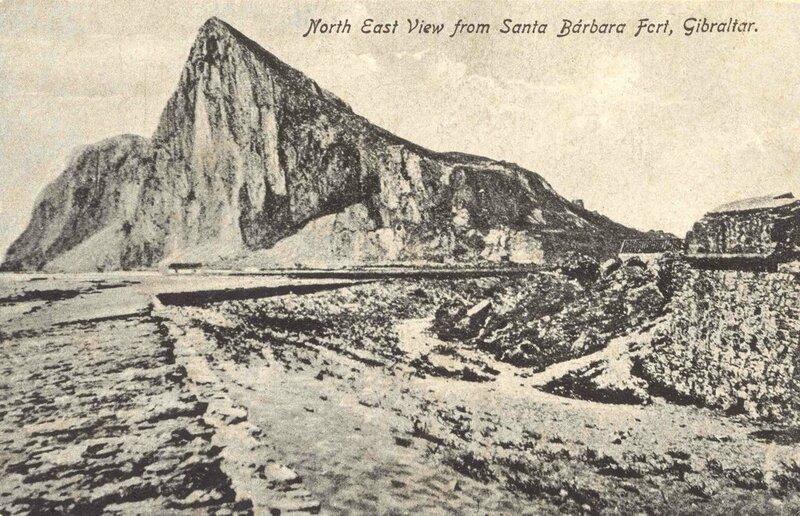 Contemporary Postcard of Gibraltar showing a bleak view of the Rock. They did not seem to be interested in tourism in those days. To send this postcard overseas would have cost 1d. Local cost was ½ d.
No-one outside the families of tin-pot South American dictators has ever ended up with a string of letters after his name as long as Sir George. Apart from his VC it is hard to understand how he obtained them. 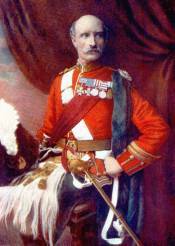 During the Boer War White is alleged to have committed a serious of disastrous mistakes culminating in being bottled up during the famous siege of Ladysmith with a substantial force at his disposal. He compounded his error by his supine conduct during its defence and his failure to provide those who attempted to raise the siege with any worthwhile assistance. His reward was to be made Governor of Gibraltar. In August, the first steamer to be repaired at Gibraltar Dockyard left the Rock. It was probably some time during the turn of the century that Diego José (3.7)decided to add another storey to 42 Crutchett's Ramp. He had the original sloping roof removed and simply added another layer of rooms on top of the second floor. He sacrificed two rooms and converted the extra space into a terrace. The old man apparently found it hard to keep himself away from the site, and on one occasion had a rather nasty fall when he insisted on going up to the roof to watch the works in progress. Nevertheless, in the end it was all, as the locals would say, 'pish pine, watermelon.' By which they meant a job well done. 'Pish pine' was probably a corruption of 'pitch' or good quality pine wood. Why the word watermelon was tagged on at the end is anybody's guess. The Governor meets his staff by Ragged Staff Gates. A curios official photograph showing the new Governor George White. Just about everybody is looking away from the camera except for the general who is the fourth fellow from the left. Meanwhile back in Alexandria the Letts family seem to have continued enjoying life as a quite well to do middleclass family. I am not quite sure whether George’s (2.3) job was technical or administrative but it seems he formed part of some sort of middle management team. Whatever the case Alexandria appears to have been quite a pleasant place for Europeans to live in those days although I also think they travelled back and forth to Gibraltar every so often. The photographs that survive of this era suggest they were enjoying themselves as a newly married couple with a beautiful young daughter. 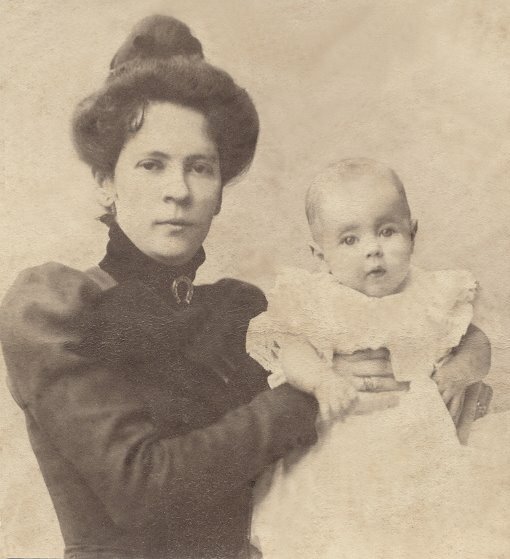 Maria Luisa Letts (2.4) and her daughter Evelyn (1.2). It seems to me that this photograph epitomises Maria Luisa in all her glory. Handsome, proud and unsmiling she doesn’t cuddle her daughter but simply presents her to the camera. 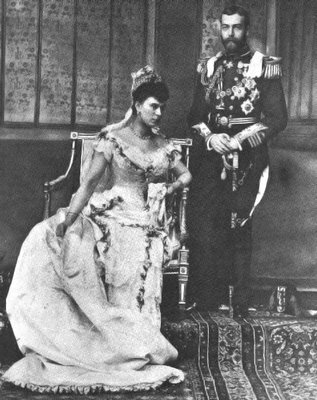 Note Maria Luisa’s elegant dress, unusual hairstyle and, once again, her lucky horseshoe broach. 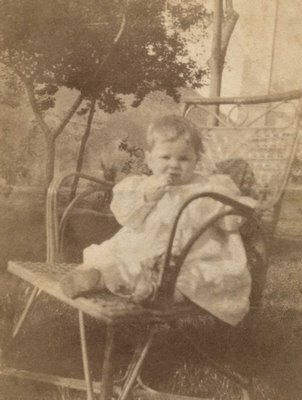 My mother Evelyn Letts (1.2) in Alexandria, probably less than one year old. 1901/2 The Duke and Duchess of York came on a visit to Gibraltar and the Chamber of Commerce distributed food to the poor. Duke and Duchess of York. It was now the turn of Messrs. Bland & Co. to celebrate the occasion by distributing meat, potatoes and bread. Things were looking up. The census showed a civilian population of 20 355. That same year Queen Victoria died and Edward VII was crowned king. The Boer War came to an end, and the new king visited the Rock. My mother probably about two years old. Evelyn Letts (1.2). 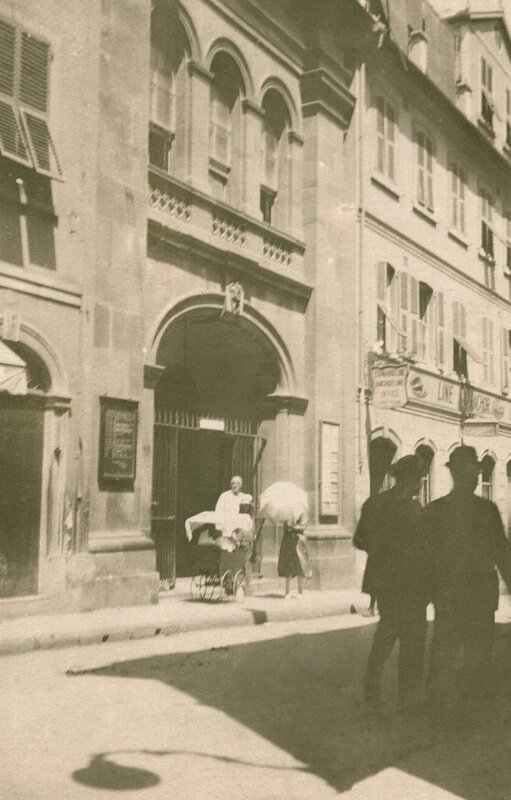 Photograph taken in Alexandria by Fettel and Bernard, Rue Cherif Pacha, Maison Toussoun Pacha. Note armband, crucifix and doll. 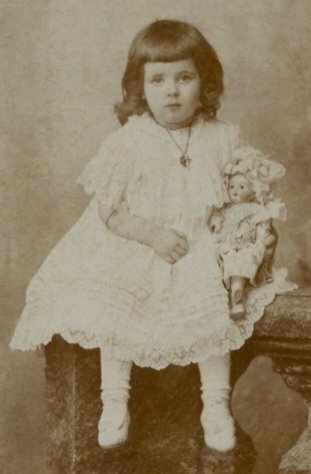 On the back of the photograph it says: 'Lina Letts age 3 years Nov 7 1902'. 'Para (a violently crossed out name) de su amiga Lina.' Below that: 'Para Mamma, Lina 3 years old'. I wonder what happened. The writing is Maria Luisa’s (2.4). 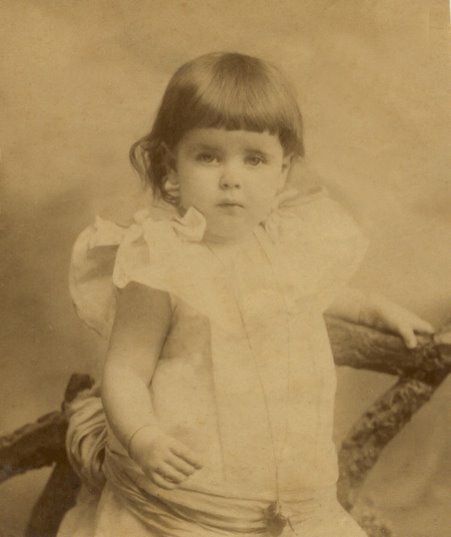 My grandmother Maria Luisa Letts (2.4) in her heyday. I find it difficult to date this photograph but I think it was taken in Gibraltar. They may have returned for a holiday or to simply to say goodbye to their respective families as they were about to leave for Bombay. 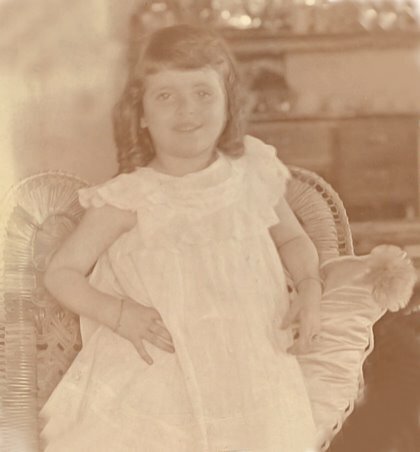 By all accounts her great grandson Eric Chipulina junior bears a striking resemblance to her. Note lucky broach yet again. It was somewhere around this period that Maria Luisa gave birth to her second daughter Edith. I know very little about her other than that she died when she was less that two years old. 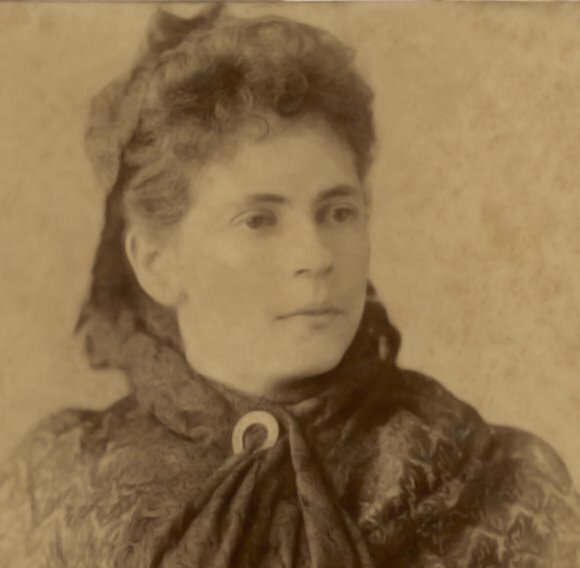 Perhaps not all that surprisingly her mother never talked about her. 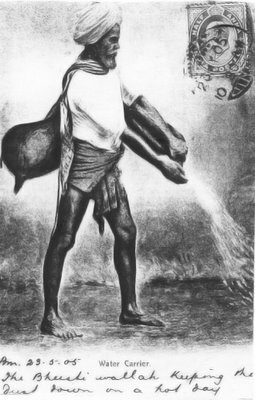 1903 The following year George Letts (2.3) was posted to Bombay, India, as Supervisor of the ETC. His home address was: 8 Navsari Chambers, Outram Road, Bombay. It seems that he and his family lived there in some style, with not a few servants in attendance. 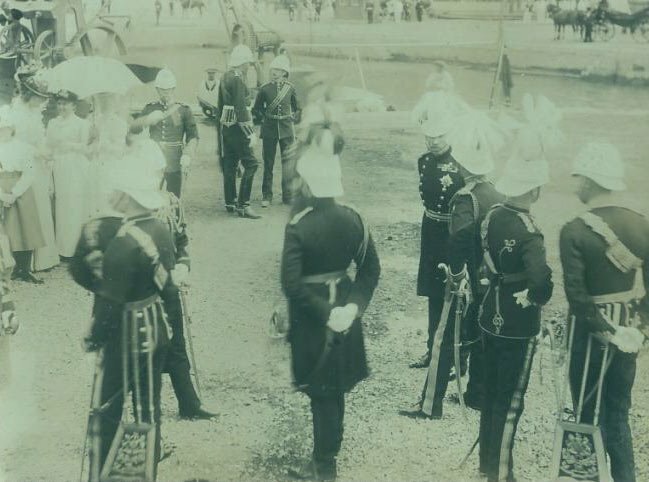 Life as part of the British Raj. It’s Tiffin time in Bombay for Evelyn Letts (1.2). Her mother Maria Luisa looks on approvingly surrounded by family servants. The baby with the blurred face is Edith. She died soon after the photo was taken. My sister Maruja believes that Maria Luisa (2.4) scratched out Edith’s face. Apparently she had a habit of doing this to people in certain photographs but this is the only example that I have come across. Pictures from Bombay. 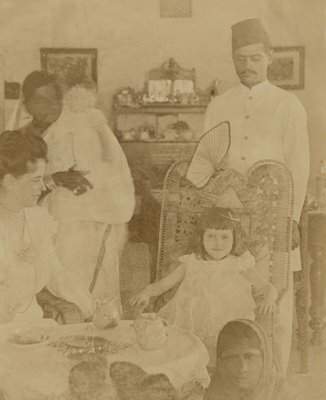 On the left, my mother on my grandfather’s knee being looked after by a servant. The top picture is of my mother when she was about four. The postcard was sent on the 23 of May 1905. The writing is probably my grandfathers. It says: ‘The Bhusli Wallah keeping the dust down on a hot day. My mother in Bombay. This snapshot was obviously taken at the same time as the previous two. The original was cut into a circle. As mention previously, according to my sister, my grandmother very often destroyed, defaced or cut up photographs which she did not approve of. In this case, however, I think it was my mother who cut the photograph.